Dave and I had to be in Coventry, England for a business meeting while we were overseas recently, and we decided that we would stay over in a Gastro Pub in Warwick for the night. We chose The Tilted Wig because of its name and we were not disappointed at all. Situated at 11 Market Square (CV34 4SA) with the parking in New Street, this lively pub offers rooms upstairs for short stay accommodation. 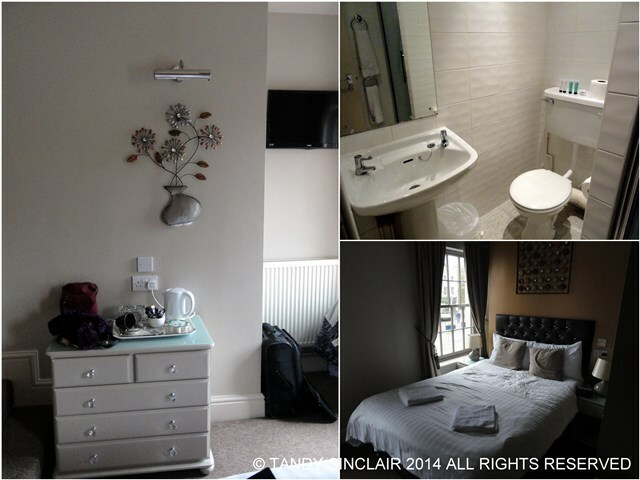 The rooms are small but comfortable, beautifully appointed and perfect for a few night’s away. Amenities in the room include coffee (both decaf and regular), tea, milk and sugar and the kettle (not cordless) is the right size to make 2 cups of coffee etc. in the cups provided. Water glasses are also provided, and the tap water is perfectly safe to drink in England. We could have put our clothing into the chest of drawers and the cupboard (which had an assortment of hangers) but as we were only staying a night, we just ‘lived’ out of the suitcase. A hair dryer is is in one of the drawers for those of you who have long hair, or don’t like going out with wet hair. There are side tables alongside the double bed, with reading lamps that don’t offer too much light. The bathroom is tiny, with a shower, handbasin and loo. Like most of the European hotels we stay in, the shower is designed for skinny people and like the majority of showers in the UK, it is a push through system and the hotter you make the water, the lower the pressure is. Personally I find this extremely frustrating as we are spoilt with a huge shower, great pressure and water as hot as you can stand it. But, for one or two nights this is not a problem. Mason and Miller shampoo and shower gel, as well as Lux soap was provided but the hair and body gel container was empty. There were 2 hand towels and 2 bath towels. I liked the fact that you need the key to lock the door as this means you don’t slam it shut with your key in the room by mistake. Being a pub, keep in mind that the noise will last until 11pm when they close, and if you are noise sensitive, bring ear plugs. I did not mind falling asleep after 11pm and it was amazingly quiet after that. The cost for the room, including breakfast for the two of us was £65 and for an extra £10 per head we could have a 3 course meal. This price excluded all drinks. Wines are showcased from France, Italy, Chile, South Africa, Spain, Portugal, Argentina, New Zealand, England and Australia. From South Africa we could have chosen the False Bay Shiraz for £15.65 or the Peacock Ridge Chenin Blanc for £20.25. These are both from Waterkloof Wine Estate. The only English representation is a bubbly – Henners Brut £50. 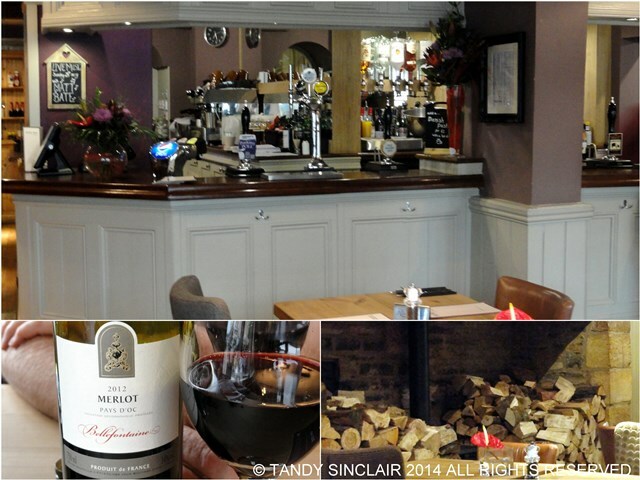 We chose the Bellefontaine Merlot from France (£15.25) which was light and fruity. Food is freshly prepared, free range and locally sourced where possible. 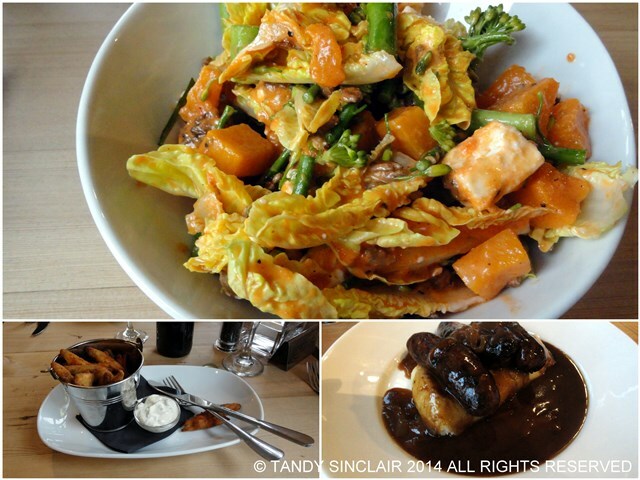 There are vegetarian options on the menu, as well as a traditional roast meal on a Sunday. The average price per meal is £10.80. Dave had the devilled white bait as his starter (£5.25) which was spicy and came with a good tartar sauce. 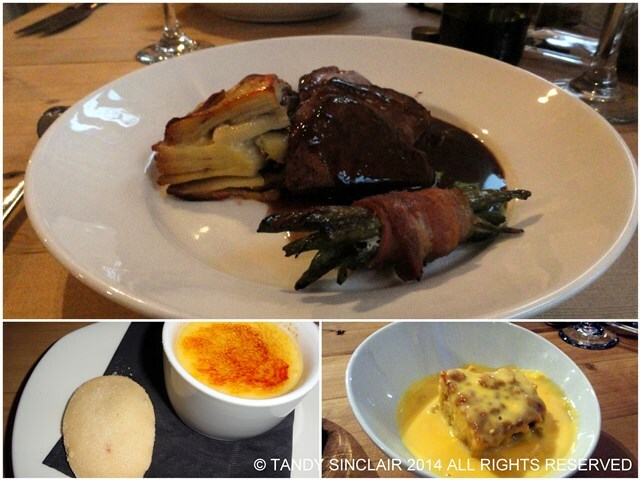 His main course was the roast breast of duck served with dauphinoise potato, bacon wrapped French beans and a port wine reduction (£13.50). The duck was slightly overdone to how we would normally have it but the meal was very nice. I started with the superfood salad (£5.50) which was fresh and crispy! I loved the addition of the harissa to this dish. I chose local sausages (£9.50) for my main course which came with a delicious mustard mash and a rich brown onion gravy. The plates were hot and the meal was hearty. Desserts are all £4 unless you choose one of the ice creams from Churchfields Farm which are £3.95. I had the crème brûlée for dessert which was so smooth and was served with a crumbly biscuit. Dave had the apple crumble cake with custard which was a perfect end to his meal. For breakfast we had a choice of cereals, pastries, bread and muffins. For toppings there was jams, honey, marmite and individually wrapped wedges of farm butter. Hot choices included porridge, a breakfast roll and a full English breakfast. Not being too hungry, Dave and I both had the eggs Benedict (£5.50) which was served with a doorstop slice of bloomer bread that had been toasted. The eggs were nicely poached, albeit cold and the Hollandaise sauce was perfectly acidic. I like that the pub uses decent napkins and good quality cutlery and crockery. The staff are pleasant and attentive and the place is clean! Our entire evening away cost us £100.25 excluding the tip – an absolute bargain. 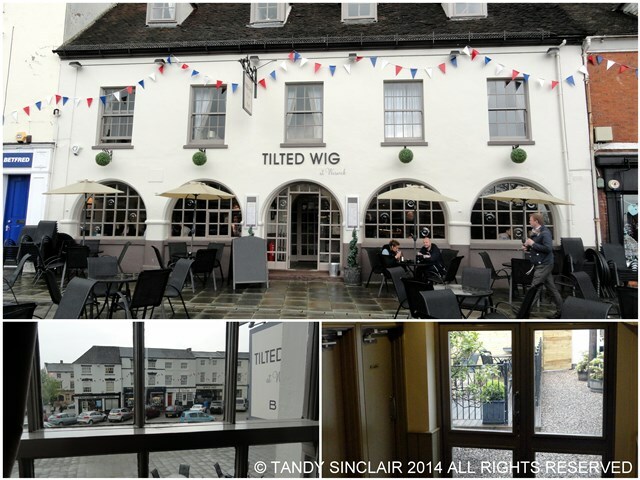 If ever you find yourself in Warwick I can highly recommend that you pop into The Tilted Wig if not for a meal and a stay, at least for a drink. Hi from the Tilted Wig. Thank you for writing such a fantastic review, we are so glad that you enjoyed your stay with us. The photos are brilliant, would you mind if we shared a link to this on our Facebook and Twitter pages please? Hi from the Tilted Wig, I just wanted to thank you for the lovely review. We are so glad that you enjoyed your stay with us. Your photos are brilliant, Would you mind if I shared a link to this on our twitter and Facebook pages please? A bargain indeed and it looks like you had a great meal too! This sounds like a wonderful place Tandy. What a cute name. This looks so beautiful! You must have had such an enjoyable stay here! 🙂 And the food looks so amazing too! In my head I was reading this post like an Englishman, I read Titled Pig, not the Tilted Wig… I must be really tired or something. LOL! It looks so quaint, love that they have the old school key system too. The food looks pretty darn tasty too. Reckon Ill pop this place on the list to visit before I die. Thanks for sharing Tandy. 🙂 Have a wonderful week. The Tilted Wig! I visited a pub in Chester called The Horned Woman. Those Brits are a laugh aren’t they? Oh, I have to look for the Horned Woman – the name is just perfect! 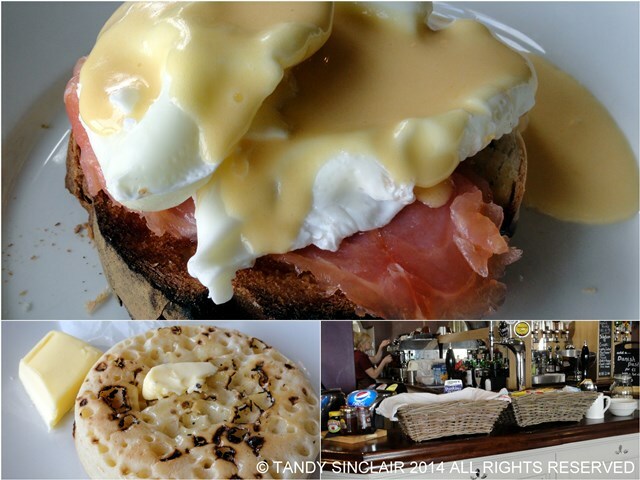 Those poached eggs are a perfection…with salmon, hollandaise on the crunchy toast! Sounds like a great place, Tandy…glad you had a good visit. What a lovely stay you had Tandy.